Alex Hall is a welcomed addition to the Soundtrack Loops production team. He is a former founding member of Marscruiser, the producers of “Elementalelectrofunk” feat. George Clinton. Current projects include “Future Living” on Longhall Recording, “Take Pride” on Polytechnic Recordings, and “Nuns on Waterskis” on Polytechnic Recordings. 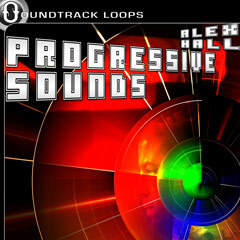 For producing Progressive Dance music. Sound folders include Leads, Pads, Fx, Bass, Percussion, and Drum kit’s. Recorded at 130 BPM and in the key family of “D”. 100 Loops – 24 bit 44.1kHz Stereo.